Straubing, October 2018 – When the 13th edition of the "Midsummer Night's Dream Munich" took place in Munich's Olympic Park, it did so under literally heavenly conditions: cloudless skies, a mild 25 degrees temperature and an incomparable show. 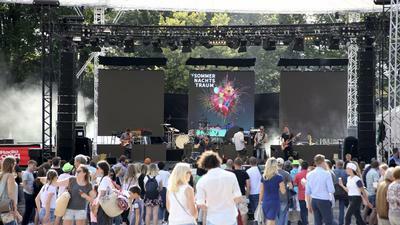 More than 30,000 spectators were treated to performances by 12 top-class live acts – including Clueso and OMD – as well as street art, food trucks and the largest and most spectacular fireworks show in Germany. TC Showtechnik was responsible for the entire technical production, for which Managing Director Martin Schulze drew on the experience of many years in the live events sector, during which he has often used systems from Electro-Voice and Dynacord. Three stages required sound reinforcement. The two smaller stages were served by XLD line array systems, with very compact XLE enclosures fielded as front-fills and ETX loudspeakers deployed as a sub arc array. All performed their tasks flawlessly. More challenging was the provision of a suitable sound reinforcement system for the main stage, on which headline acts Clueso and OMD performed. The biggest challenge was the floating sound system covering the expansive Olympic Lake. “We invested most of our time in developing this concept,” says Schulze, describing how TC Showtechnik conceived the solution at its Eglfing headquarters. It comprised a very effective combination of Dynacord V17 bass elements topped with Electro-Voice XLE elements. “Once we had measured the system on land, all we had to do on the water was ensure that the clusters were positioned in a complementary manner.” The compact design of the V17 and the relatively low weight of 17 kg XLE enclosures were key factors in the choice of loudspeakers. The X2 line array was driven by Electro-Voice TG7 amplifiers equipped with RCM-28 modules for monitoring and remote control. In addition, a significant number of Dynacord L2800FD and L3600FD amplifiers were deployed, prompting more praise from Schulze: “The value for money is excellent and the ease of use leaves nothing to be desired. You can quickly access the parameters via USB and the rest is simple: load the presets, set the time alignment and you're done”. Through the use of OMNEO IP technology, audio transport, remote control and monitoring was all achieved via Dante.